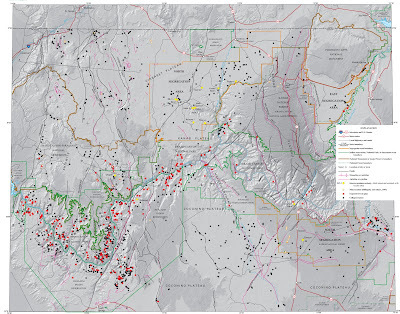 Don Bills, with the USGS, summarized some of the results in the study they released back in February on the northern Arizona uranium province. For comparison, Don noted that 1 ton of uranium produces energy equal to 40 million kilowatt-hours, which would require 16,000 tons of coal or 80,000 barrels of oil. Don pointed out that most water tables in the region are about 1,000 feet below the uranium-bearing zone in the breccia pipes, but there are perched water tables in some areas that have the potential to be impacted by mining. Did lake overflow form the Salt River Valley?